IWSAW organizes a panel discussion on civil marriage in Lebanon as a commemoration of International Women’s Day. Activists, officials and students attended the event. 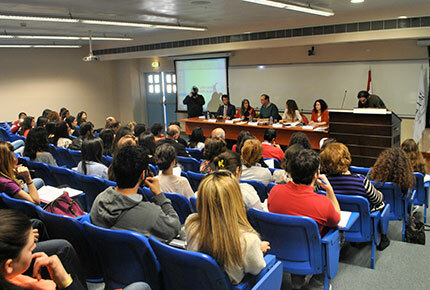 The Institute for Women’s Studies in the Arab World (IWSAW) at LAU celebrated International Women’s Day by organizing a panel discussion entitled “Civil Marriage and the Confessional System: Challenges and Consequences” on March 12 on the Beirut campus. While civil marriage gives men and women equal rights, religious marriage — and consequently divorce and inheritance — is governed by sectarian laws that are unjust toward women. The forum addressed the various civil marriage draft laws that were previously proposed in Lebanon, civil society activism, and how civil marriage can be contracted in light of the Lebanese confessional system. Nothing short of the norm in the West, civil marriage remains an oddity in the Middle East. True enough, the Lebanese state both recognizes and acknowledges it; the Lebanese law, however, prohibits its celebration in Lebanon. This has led many Lebanese couples — mainly mixed couples — to contract civil marriage in foreign countries, with Cyprus as a prime destination. Legal activists in support of legalizing civil marriage in Lebanon have been attempting to introduce secular unions into the legal system since the late 1950s, but their invigorating efforts have redoubled in recent months since the brave and in-love Khouloud Sukkarrieh and Nidal Darwish became the first couple to date to decide to get a civil marriage in Lebanon. Arguably, however, the Lebanese law does make provision for civil marriage, and an interpretation of decree number 60 indicates that people with no religious affiliation can be granted civil rights. “Every religious group has its own laws in Lebanon, but what we lack is a personal status law that can be applied to all Lebanese regardless of their religious affiliation,” said Younan. Indeed, Joseph Bechara, the notary who signed the civil marriage contract of Sukkarieh and Darwish, stressed the importance of eradicating sectarianism from “legal documents and souls” alike.